September | 2014 | ride.hike.eat. Oh Good Luck… where do I even begin?!? I just love you! I really do. Good Luck in my opinion is one the best restaurants in town. Every time I visit, it just gets better and better. I am not sure how that can even be possible, since every meal is just super. Every time! But it is true. I realize that there are other restaurants in town that are perhaps just as good, but I cannot get myself to go anywhere else. It is not like I visit it that often… we only go there for special occasions. Maybe it is because I know that I will always have a memorable dinner there. It is just perfect. First, the cocktails. I admit that I find myself asking the server what a lot of the ingredients are, but even so, the drinks are SO good. Somehow all the different ingredient combinations just work. So creative! My latest find is the 1620 Japan… bonded bourbon, plum wine lavender syrup, lemon, Regan’s bitters, soda, sorrel, fresh mint. Oh my! And I do not even like bourbon. Ha! I hope that it will be on the menu next time I visit. It is definitely a keeper. Then, the food. I really love how the dishes are made to share. It provides an opportunity for the group to taste multiple dishes. And that is exactly what we do. Another favorite is the organic greens salad with avocado vinaigrette. That’s right… avocado vinaigrette. It is a simple salad, but the vinaigrette makes the dish. Once again, bread is definitely necessary to scrape the plate. No residual allowed here either. The other dish that is becoming a favorite and that I hesitate to admit to is the burger. I know what you are saying… “You do not eat beef, Veronica!”… I know! But the burger at Good Luck is SO good. I do not know what they do to it, but it is so tasty. Again, I really do not want to admit it, but cannot help myself. Ha! And the fries are amazing too… thinly cut (my favorite), a little crispy, and salty. A perfect companion to the burger. The last thing that I would like to mention is the chocolate cake. The first few times I ate at Good Luck when they first opened, the chocolate cake was made into a shallow ramekin. It was served straight out of the oven and the top was crispy and the middle was gooey. Oh my! Joel and I would go there just to have the cake and drinks. Then over the years, the cake evolved into a smaller and taller cake. It still comes right out of the oven, but it is no longer gooey. At first we were disappointed, but during our last two visits, we decided that it is just as good, maybe even better than it was originally. Their menu changes with the seasons, which I love. But sometimes it is sad since the dishes are not exactly how I remember them. Their evolution, however, is never a disappointment. The chefs are so creative and amazing. Just like the drinks, the different ingredient combinations that they blend just work. So yeah, Good Luck… I really do love you! You are just perfect! The tomatoes this year have been super! 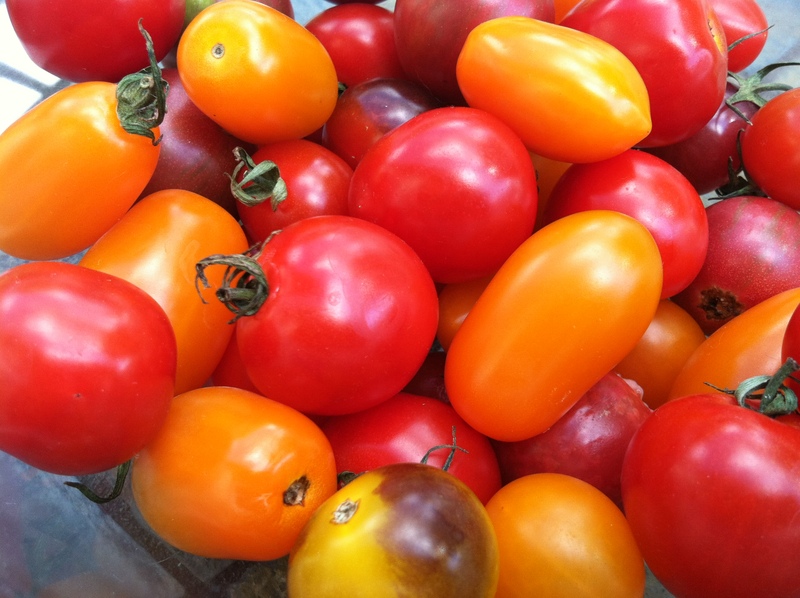 Each week I look forward to visiting one of my favorite vendors at the Fairport Farmer’s Market, who has some really nice cherry tomatoes… yellow (round and oval), red (also round and oval), dark red, orange. They are just delicious! Julia loves them too. She eats them like candy… she loves to bite into them especially the oval shaped yellow tomatoes. On Friday I happened to catch a show on PBS called A Chef’s Life. The show is about a restaurant called Chef & The Farmer that is located in North Carolina. What caught my attention was the narrator’s (who was also the chef) description of a tomato sandwich that she ate growing up. Two slices of freshly baked bread, thick tomato slices that were sprinkled with salt and pepper, and some mayo. My mouth was watering. As she was describing the sandwich, the footage showed this amazing sandwich that was made on a round loaf of bread that had a hole in the middle. 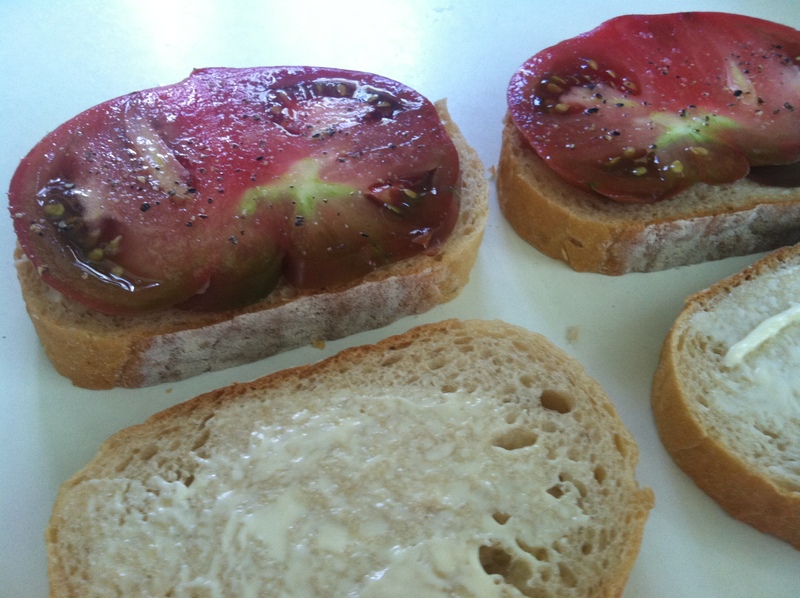 It also showed a chef assembling the sandwich, using the most beautiful heirloom tomatoes. 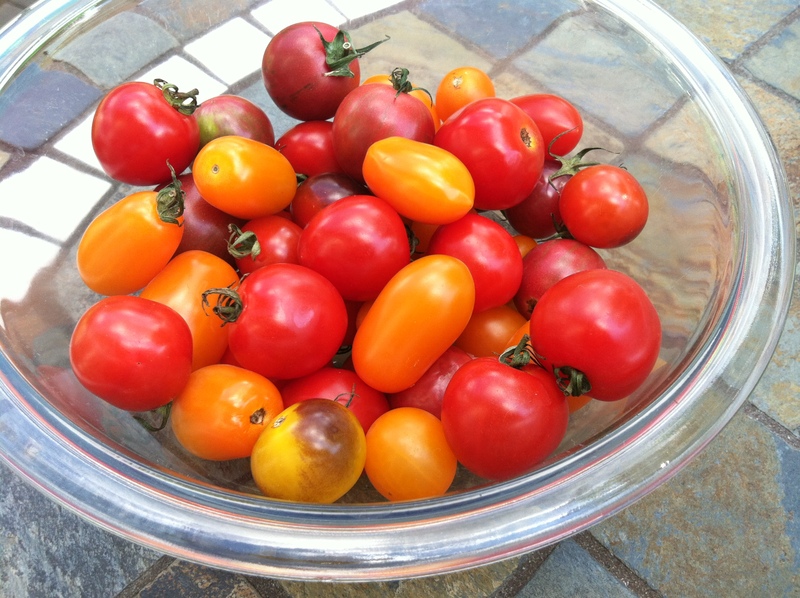 I was immediately taken back to my tomato girl, who grew these just as beautiful and delicious heirloom tomatoes. I unfortunately have not seen her at the market in a long time, but I always think about her tomatoes. My friend Kristin and her mom visited this past weekend. They drove from Boston to Rochester and on their way they stopped at a farmer’s market. Once they arrived, Kristin told me all about the market and mentioned that she bought some heirloom tomatoes. I could not believe it! How timely! Although I did not have freshly baked home made bread, my sandwich was just as I imagined… super tasty! I inhaled it and had seconds. :) I used Italian bread from Wegmans, that was warm when I bought it, the largest heirloom tomato that Kristin brought, and Wegmans Organic Mayo. The key is sprinkling the tomato with lots of salt and a touch of pepper. It definitely made the sandwich, just as the chef from Chef & The Farmer mentioned. My favorite part about the PBS show was the scene where the chef/narrator was meeting with her staff to talk about the menu. She told her staff that they had to really talk up the sandwich, since it was a tomato sandwich and people will think that they were just lazy for serving it. She further told them to mention that the bread was freshly baked in house, the heirloom tomatoes were bought from a local farmer, and that even the mayo/spread (it escaped my mind) was made in house. Who would not want to try that sandwich?!? It is definitely not a lazy person’s sandwich. 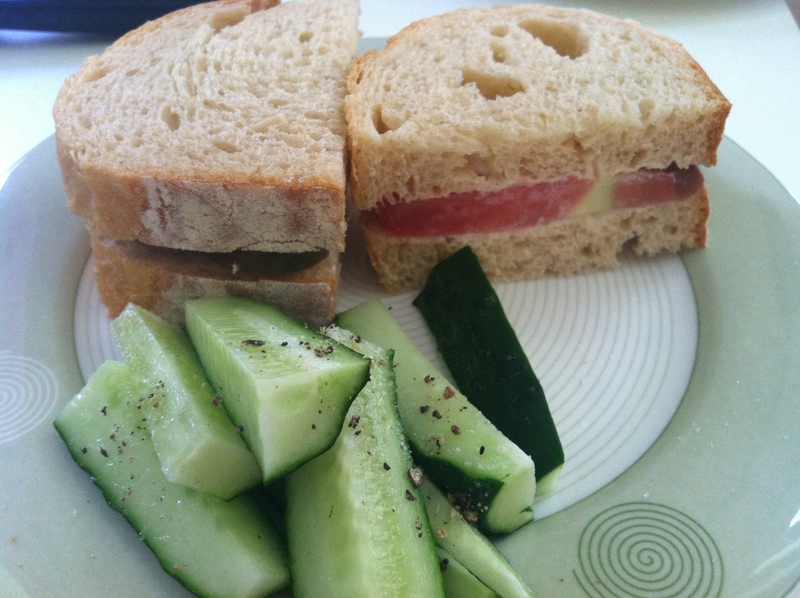 Next time you are at a market, do buy some tomatoes and make yourself a tomato sandwich. It is the perfect summer sandwich!